For one thing, people have been getting high—and subsequently, too high—for thousands of years. Surely this couldn’t be the first time someone had attempted to address the issue. For another, you could call something as simple as black pepper a cannabis antidote; thanks to the chemical similarities between cannabis and black pepper, peppercorns contain caryophyllene, a terpene also found in cannabis that binds to the same receptors targeted by THC and produces a calming effect. Inhaling a little black pepper when you’re too high helps bring you down almost immediately. Still, I was happy to support a local startup business and give CannaSafety’s patent-pending product, CannaRelief, a shot. Ingredients: Water, Sugar, Ascorbic Acid (Vitamin C), Organic Guayusa Concentrate, Natural Flavors, Citicoline, Ginger Root Extract, CBD (Cannabidiol) Oil, Citric Acid, Pyridoxine Hydrochloride (Vitamin B-6), Potassium Sorbate (preservative), Sodium Benzoate (preservative), Polysorbate 80, Sodium Citrate, Cyanocobalamin (Vitamin B-12). My three bottles of CannaRelief arrived a few days after I ordered them online, and I recruited two coworkers to help me test them out. Bailey would try CannaRelief as an antidote to dabs, Lisa to edibles, and I to flower. Our experiments proceeded as follows. Bailey Rahn: “Taking the biggest dab of my life called for ramen, but when the hostess showed us to our table, I already knew I was in trouble. We were mere inches from our neighbors to the left and right, and they would hear every high thing I would say for the next thirty minutes—or however long it would take to scarf this noodle bowl and get the eff out of here. It’s that feeling when you think you’re only a little high, and then you go out into public and suddenly you realize you are really, really, really high. That’s what went down, and I guzzled my CannaRelief the moment I got home in hopes of relieving this severe social anxiety. The taste wasn’t pleasant, but it wasn’t disgusting either. It tasted a lot like 5-Hour Energy—and coincidentally came in the same size bottle. I settled down with my partner and some video games and waited for the anxiety to subside. Within 20 minutes, my mind seemed clear of the haze that was blocking all ability to speak intelligibly, and talking with my partner no longer felt as nerve-wracking as a first date. Lisa Rough: “Getting ready to test CannaRelief involved pulling out a particularly strong edible that I’d been saving for a rainy day. It was homemade and estimated to be about 100mg of THC. I enjoy edibles regularly, but I generally stick to the 10mg doses that are the standard serving size in Washington. I decided to eat just a portion of the edible first, estimating a few bites to be about 30mg, or about three times my normal dose. I decided to make tacos. I began chopping onions and putting the ingredients in the pan. I wandered back to the living room and nibbled a bit more of the edible. As I stirred the ingredients in the pan, I started giggling. Wait, when does the seasoning go in? Oh, yes, the edible was hitting me. I sat down to watch Saturday Night Live with my tacos, feeling the high increase with each bite. I finished my taco and considered my elevated state. Was that a twinge of paranoia? Now was the time to administer the CannaRelief. I searched through my bag, in every pocket and crevice, before finding the little bottle in my laptop bag. I twisted the top off and took a swig. It tasted a little citrus-y, with hints of lime. Not bad. I read the instructions on the label which advised me to drink the whole bottle. Like Alice in Wonderland with a bottle that says “Drink me,” I shrugged and finished it. Unfortunately, the THC-induced paranoia got worse before it got better, so I decided to take a bath. As I drew the bath, the anxiety started to wash away. By the time I was in the water, I was feeling high and happy and carefree again. Brett Konen: “At this point in my cannabis career, it takes a lot of joints to get me too high. I had rolled five in preparation for my experiment. By the third joint, my throat was killing me. Halfway through the fourth, I switched to vaping flower. Luckily, I was soon past the point of being comfortably high and getting to the right level to try the CannaRelief. The first sip was an odd, zingy mix of flavors along the lines of lime, berry, and pine, which somehow managed to impart an artificial aftertaste in spite of the fact that the beverage says “naturally flavored.” I didn’t mind it terribly at first, but by the end I was pretty over the flavor. On the bright side, it took my mind off my high. Being as elevated as I was, I quickly forgot that I had consumed the CannaRelief at all. Twenty-five minutes later, I remembered and did a quick mental self-check. I was still quite high, but no longer unpleasantly high, yet I was hesitant to attribute this solely to the CannaRelief. Half an hour is often an antidote unto itself. 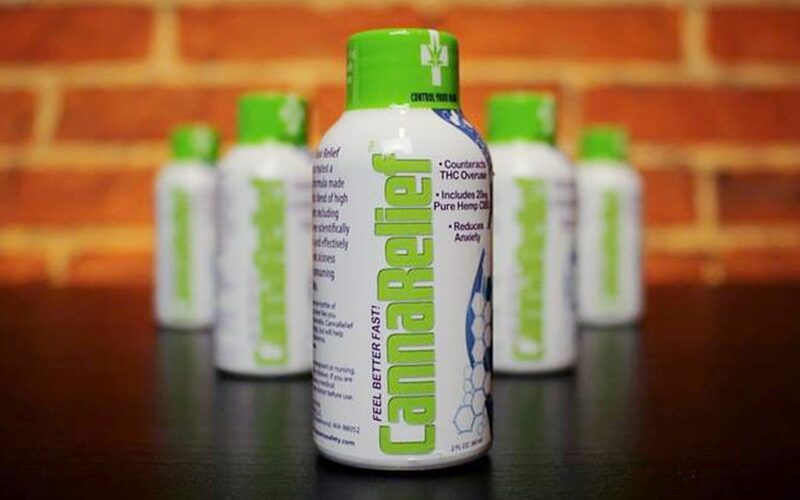 Here’s what we can conclude about the effectiveness of CannaRelief after our experimentation. It doesn’t work instantly. You’re looking at at least a 20-minute wait for the effects of THC overindulgence to subside, and as noted on the bottle, everyone’s body chemistry and metabolism are different. It’s a little pricey. Twenty minutes are often plenty of time for a high to wane on its own, so throwing $15 into those twenty minutes may feel like a waste of money for some—particularly when you probably spent less to get that high in the first place. There are other ways to deal with an unpleasant high. Here, for instance, are eight of them—in particular, don’t forget about that black pepper trick. 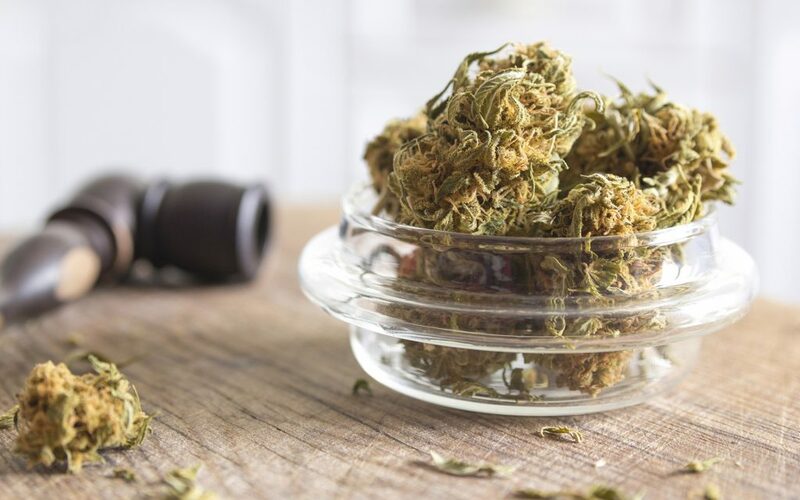 Also, CBD on its own can help counteract THC-induced anxiety. This antidote may work best for edibles. 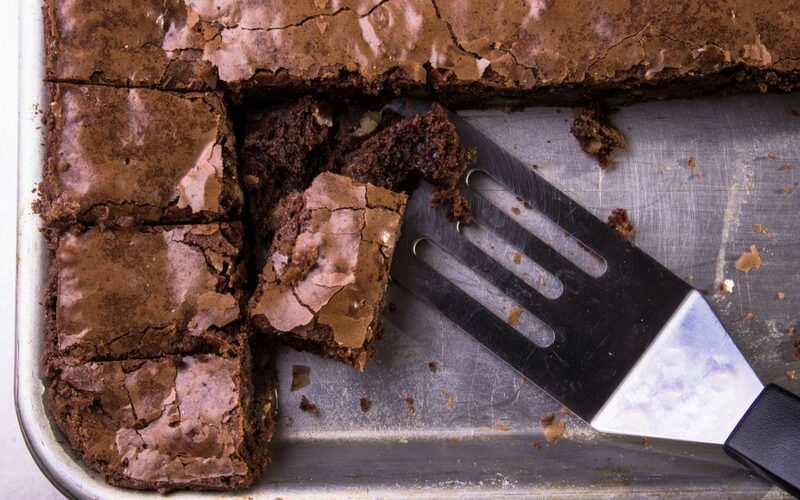 As Lisa observed, the effects of smoking or vaping are generally quicker to wear off than those of edibles, and dosing edibles (especially homemade ones) is already tricky. When you’re looking at one to two hours of intense elevation, a 20-minute wait doesn’t sound so bad. It’s nice to have in a pinch. All three of us who tested the CannaRelief agree that it’s worth having a bottle on hand, if for no other reason than to promote peace of mind. If you know you’ve got a rainy-day remedy for a case of extreme overindulgence (yours or a friend’s), you’ll be a lot less likely to be paranoid when you’re getting high in the first place. 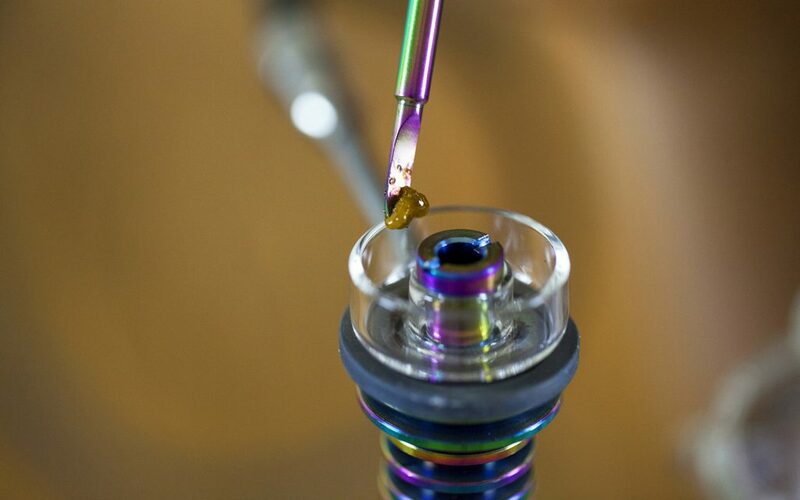 Source: Does ‘The World’s First Cannabis Antidote’ Actually Work?